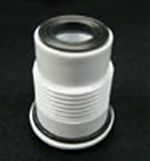 If you have pinpointed a faulty piston seal shaft on your marine toilet as the cause of problems, you can get replacement parts at Boatersland at a low cost. Our parts ship fast enabling you to begin your repair project quickly. The Raritan 1214W Piston Seal Shaft, part number RAR1214W, is designed for their PHII and PHEII marine toilets and are designed to fit on pumps manufactured after June 1992. If you need quality Raritan repair parts, marine heads or marine toilets, visit Boatersland.